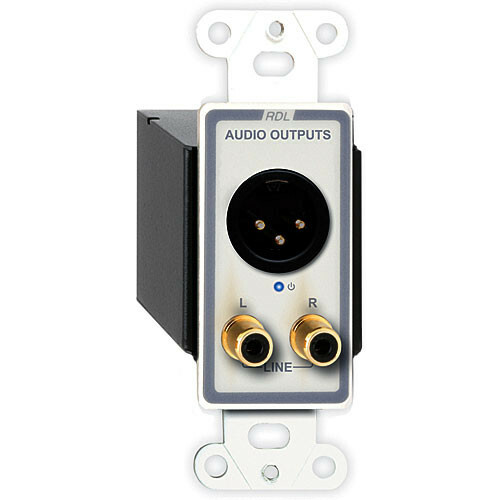 The D-TPR3A Active Triple Pair XLR and RCA Stereo Audio Output over RJ45 Receiver Module from RDL is a three-pair audio receiving module compatible with RDL Format-A twisted pair products. The D-TPR3A features a white front-panel laminate with gray lettering that matches RDL Decora-style remote controls. The D-TPR3A module features an XLR audio output and two RCA phono jack outputs, one for the left channel and one for the right channel. The audio signal received from pair A of the RJ45 input jack feeds the XLR audio output jack. The output level from the XLR jack is set to either Mic or Line level during installation using a rear-panel switch. The audio signals received from pairs B and C of the twisted pair cable are buffered to drive the RCA output jacks at the standard -10 dBV consumer level. The D-TPR3A module can access signals from all three cable pairs, and additional receivers may be connected to the same twisted pair feed. The bridging input circuits used in all Format-A twisted pair receivers allow connection of up to 10 receiver outputs for each cable pair. The D-TPR3A can be powered directly from a 24 VDC power supply using the rear-panel detachable terminal block. Local power connected to the module is also fed to all connected remote modules. The D-TPR3A can be remotely powered through the twisted pair cable from any other module, signal distributor or RDL power inserter connected to the same twisted pair cable. Module power is indicated by a front-panel LED. This module is designed to be mounted in wall boxes, cabinets or other enclosures that allow users to connect external equipment. The D-TPR3A model can be mounted in RDL WB-1U and WB-2U wall boxes, or in standard U.S. electrical boxes. Box Dimensions (LxWxH) 4.8 x 4.3 x 2.2"